Thirsty Pilgrim: Brewpubs, Drinking Local, Session Beer, and Tax Cuts. Brewpubs, Drinking Local, Session Beer, and Tax Cuts. In case you're still trying to work out where to take your summer vacation, the USA Today's travel section asks Andy Crouch to name 10 of the country's most interesting brewpubs. And it works in a plug for Andy's Great American Craft Beer book. So did I. In a recent Beer Advocate column, Andy opines on craft brewers reducing their distribution rather than trying to compete in all 50 states. The Great Beer Retreat, he calls it. "We are entering a new era of craft beer, one in which selection around the country may shrink but where local beer will grow increasingly strong and entrenched roots." Have a look at your own hometown. What do you see? In my hometown of Springfield, Mo., I see a brand spanking new brewhouse that sold 120 barrels to locals in its first two weeks. It has lots of room to expand. Now in Springfield there are people drinking craft beer who never gave it much thought before. It's easy to weigh that against a few hypothetical geeks ringing their hands over not being able to find some Dogfish Head special release. Very easy. Three of my favorite things: St. Louis, D.C. and beer. So I was tickled to hear recently about the collaboration between Schlafly of St. Louis and three D.C.-area publicans of quality watering holes: Greg Engert of ChurchKey, Greg Jasgur of Pizza Paradiso and Sam Fitz of Meridian Pint. I was even more tickled to learn that the collaboration was a 4.2% abv dry-hopped pale ale called House in Session. The idea is to raise awareness about proposed cuts in excise taxes that would make life easier on smaller brewers. More info on that from the Brewers Association, if you're interested. 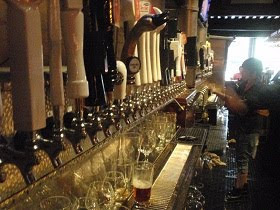 Yes, craft brewers lobby for handouts just like everyone else. At first glance it would appear to be a positive thing for drinkers as well, possibly leading to wider choice and (dare we hope?) lower prices. Here's more knowledge from the Washington City Paper.